Sometimes space can be a little tight and doing the dishes by hand can be time-consuming. That is why there are compact and small solutions to help with big chores. Here is a list of the best compact dishwashers for your apartment or tight space areas. Perfect for any apartment or small space. This unit offers full-size power in a small design. Its height is ideal to fit between cabinets and the refrigerator. This washer loads up to six standard size plates. SPT features easy controls and water temperature up to 148-Degree F.
Danby’s Electronic Dishwasher DDW611WLED Energy Star Countertop is perfect for those wanting to save money and conserve energy. This tiny dishwasher can hold up to 6 dishes which makes it convenient for small families. The washer comes with a quick connect system allowing you hook it up to any kitchen tap. The washer comes with 6 wash cycles that will help get your dishes sparkling clean. 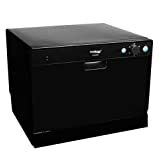 Wash up to six standard place settings on your countertop with this washer that is just over 17 inches tall and fits easily under most cabinets without any permanent installation. This dishwasher uses 200-kilowatt hours per year using 61% less energy than similar dishwashers. 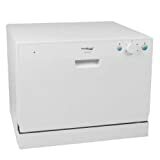 Plus, for those who are looking to save on their water bill as well, this compact dishwasher is the way to go. It comes with an LED display and digital controls making it extremely easy to operate. The water can get as hot as 149 degrees F and comes with several different cycles to get your dishes clean. This spacious washer can hold up to eight standard place settings including glasses. 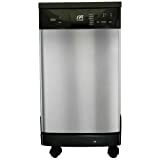 The unit has easy controls with a durable stainless steel interior and water temperature up to 154 degree F. This compact unit uses very little water, only 3.65 gallons and offers a one-year warranty for parts and labor should anything happen and needs to be fixed. With the Koldfront, you can wash up to six standard dishes with this unit that averages 17 inches tall making it convenient to in a nook of the apartment or office. This nifty dishwasher is energy efficient and can be installed easily from almost any faucet. Get your dishes cleaned while using less energy and water than a traditional full-size dishwasher. The SPT is Perfect for office kitchens who are looking for the capability of full-size washers without space. This unit can load up to 6 dishes and glasses along with all other utensils and cooking ware. The unit comes with 6 wash cycles that will accommodate heavy loads like pots and pans to light loads of just a few glasses. It comes standard with an automatic detergent and rinse agent dispenser. There is also a water supply warning indicator that helps to show whether the faucet/tap is not turned on. The unit also has a rinse aid warning indicator to show when rinse aids need to be refilled. This is a smart little washer that can be moved to other locations or offices. This compact dishwasher can squeeze into tight spaces in the home or office. You can wash 6 standard dishes in this little unit and comes with a cutlery basket and cup shelf that adds that extra touch when getting all the dishes done in one go. The unit with a 5-foot hose that makes hooking up this machine easy. 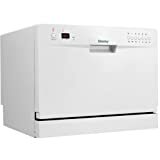 Medias counter top dishwasher is perfect for really tight spaces like you would find in a dormitory or studio apartments. Simply hook this washer up to a faucet and you are ready to go. This unit has two dish racks to separate plates from glassware and comes with 6 washing cycles to get every dish clean. The neat thing about this dishwasher is its ability to delay your wash cycle for 24 hours. 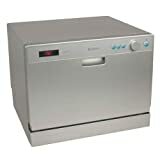 The Danby dishwasher is awesome for small families since this tiny compact washer can hold up to 8 place settings. It stands 18 inches and comes with a built in soft water system that is great for remote locations. If you happen to have a cabin or lodge and looking for a convenient way to wash your dishes, this is the unit to get. This SPT stands 17.24 inches high and comes with a delayed start. Like most compact dishwasher, this unit has plenty of room for a family of four. The unit offers easy setup and even easier controls to get your dishes clean without the high energy cost of a regular dishwasher. There are several different dishwashers available on the market, but these are some of the best money can buy. While each person is different as well as their needs, it is best to stick with an appliance that is sure to do the job right the first time and has warranties in case anything should break or needs to be replaced.